Rusty Snoutbean is shrub with trailing branches, glandular-hairy. 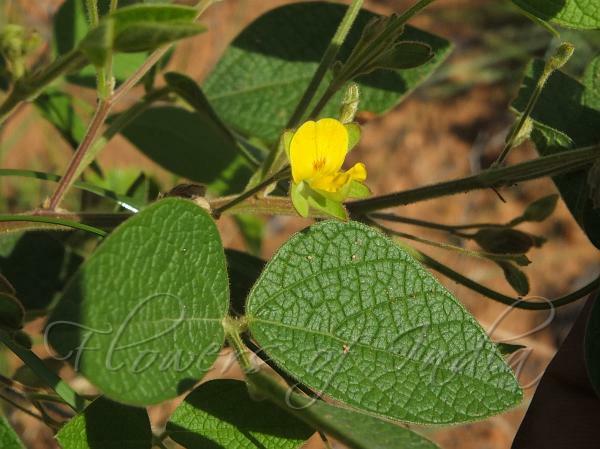 Leaves are trifoliate; leaflets 6.5 x 2.5 cm, ovate, pointed, rounded at base; leaf-stalk 4-5 cm long; stipules ovate. Flowers are borne in short racemes; calyx 8 mm long, sepals oblong, blunt; petals included, yellow; standard 7 mm diam., round, hairless; wings 5 mm long, oblong. Pods 7 x 5 mm, ovoid, turgid, minutely bristly; seed-1, black. 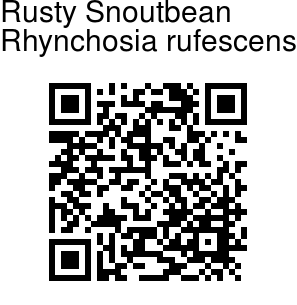 Rusty Snoutbean is found in Indo-Malesia. In India it is found in Kerala and Karnataka. Identification credit: Siddarth Machado Photographed in Ananthapur district, Andhra Pradesh.